This article is about the Frankish ruler. For other uses, see Charles Martel (disambiguation). 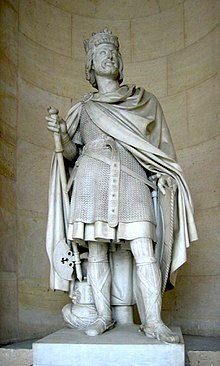 Charles Martel (c. 688 – 22 October 741) was a Frankish statesman and military leader who as Duke and Prince of the Franks and Mayor of the Palace, was the de facto ruler of Francia from 718 until his death. The son of the Frankish statesman Pepin of Herstal and a noblewoman named Alpaida, Charles successfully asserted his claims to power as successor to his father as the power behind the throne in Frankish politics. Continuing and building on his father's work, he restored centralized government in Francia and began the series of military campaigns that re-established the Franks as the undisputed masters of all Gaul. According to a near-contemporary source, the Liber Historiae Francorum, Charles was "a warrior who was uncommonly ...effective in battle". Much attention has been paid to his success in defeating an Arab raid in Aquitaine at the Battle of Tours. Alongside his military endeavours, Charles has been traditionally credited with a seminal role in the development of the Frankish system of feudalism. At the end of his reign, Charles divided Francia between his sons, Carloman and Pepin. The latter became the first king of the Carolingian dynasty. Charles' grandson, Charlemagne, extended the Frankish realms, and became the first Emperor in the West since the fall of Rome. Charles, nicknamed "Martel", or "the Hammer", in later chronicles, was the son of Pepin of Herstal and his second wife Alpaida. He had a brother named Childebrand, who later became the Frankish dux (that is, duke) of Burgundy. In older historiography, it was common to describe Charles as "illegitimate". But the dividing line between wives and concubines was not clear-cut in eighth-century Francia, and it is likely that the accusation of "illegitimacy" derives from the desire of Pepin's first wife Plectrude to see her progeny as heirs to Pepin's power. After the reign of Dagobert I (629–639) the Merovingians effectively ceded power to the Pippinid Mayors of the Palace, who ruled the Frankish realm of Austrasia in all but name. They controlled the royal treasury, dispensed patronage, and granted land and privileges in the name of the figurehead king. Charles' father, Pepin of Herstal, was able to unite the Frankish realm by conquering Neustria and Burgundy. He was the first to call himself Duke and Prince of the Franks, a title later taken up by Charles. In December 714, Pepin of Herstal died. Prior to his death, he had, at his wife Plectrude's urging, designated Theudoald, his grandson by their late son Grimoald, his heir in the entire realm. This was immediately opposed by the nobles because Theudoald was a child of only eight years of age. To prevent Charles using this unrest to his own advantage, Plectrude had him imprisoned in Cologne, the city which was intended to be her capital. This prevented an uprising on his behalf in Austrasia, but not in Neustria. Pepin's death occasioned open conflict between his heirs and the Neustrian nobles who sought political independence from Austrasian control. In 715, Dagobert III named Ragenfrid mayor of their palace, effectively declaring political independence. On 26 September 715, Ragenfrid's Neustrians met the young Theudoald's forces at the Battle of Compiegne. Theudoald was defeated and fled back to Cologne. Before the end of the year, Charles Martel had escaped from prison and been acclaimed mayor by the nobles of Austrasia. That same year, Dagobert III died and the Neustrians proclaimed Chilperic II, the cloistered son of Childeric II, as king. In 716, Chilperic and Ragenfrid together led an army into Austrasia intent on seizing the Pippinid wealth at Cologne. The Neustrians allied with another invading force under Radbod, King of the Frisians and met Charles in battle near Cologne, which was still held by Plectrude. Charles had little time to gather men, or prepare, and the result was the only defeat of his career. The Frisians held off Charles, while the king and his mayor besieged Plectrude at Cologne, where she bought them off with a substantial portion of Pepin's treasure. Then they withdrew. Charles retreated to the hills of the Eifel to gather men, and train them. Having made the proper preparations, in April 716, he fell upon the triumphant army near Malmedy as it was returning to its own province. In the ensuing Battle of Amblève, Martel attacked as the enemy rested at midday. According to one source, he split his forces into several groups which fell at them from many sides. Another suggests that while this was his intention, he then decided, given the enemy's unpreparedness, this was not necessary. In any event, the suddenness of the assault lead them to believe they were facing a much larger host. Many of the enemy fled and Martel's troops gathered the spoils of the camp. Martel's reputation increased considerably as a result, and he attracted more followers. This battle is often considered by historians as the turning point in Charles's struggle. Richard Gerberding points out that up to this time, much of Martel's support was probably from his mother's kindred in the lands around Liege. After Amblève, he seems to have won the backing of the influential Willibrord, founder of the Abbey of Echternach. The abbey had been built on land donated by Plectrude's mother, Irmina of Oeren, but most of Willibrord's missionary work had been carried out in Frisia. In joining Chilperic and Ragenfrid, Radbod of Frisia sacked Utrecht, burning churches and killing many missionaries. Willibrord and his monks were forced to flee to Echternach. Gerberding suggests that Willibrord had decided that the chances of preserving his life's work were better with a successful field commander like Martel than with Plectrude in Cologne. Willibrord subsequently baptized Martel's son Pepin. Gerberding suggests a likely date of Easter 716. Martel also received support from Bishop Pepo of Verdun. Charles took time to rally more men and prepare. By the following spring, Charles had attracted enough support to invade Neustria. Charles sent an envoy who proposed a cessation of hostilities if Chilperic would recognize his rights as mayor of the palace in Austrasia. The refusal was not unexpected but served to impress upon Martel's forces the unreasonableness of the Neustrians. They met near Cambrai at the Battle of Vincy on 21 March 717. The victorious Martel pursued the fleeing king and mayor to Paris, but as he was not yet prepared to hold the city, he turned back to deal with Plectrude and Cologne. He took the city and dispersed her adherents. Plectrude was allowed to retire to a convent; Theudoald lived to 741 under his uncle's protection, a kindness unusual for those times, when mercy to a former gaoler, or a potential rival, was rare. Upon this success, Charles proclaimed Chlothar IV king of Austrasia in opposition to Chilperic and deposed Rigobert, archbishop of Reims, replacing him with Milo, a lifelong supporter. In 718, Chilperic responded to Charles' new ascendancy by making an alliance with Odo the Great (or Eudes, as he is sometimes known), the duke of Aquitaine, who had become independent during the civil war in 715, but was again defeated, at the Battle of Soissons, by Charles. Chilperic fled with his ducal ally to the land south of the Loire and Ragenfrid fled to Angers. Soon Chlotar IV died and Odo surrendered King Chilperic in exchange for Charles recognizing his dukedom. Charles recognized Chilperic as king of the Franks in return for legitimate royal affirmation of his own mayoralty over all the kingdoms. Between 718 and 723, Charles secured his power through a series of victories. Having unified the Franks under his banner, Charles was determined to punish the Saxons who had invaded Austrasia. Therefore, late in 718, he laid waste their country to the banks of the Weser, the Lippe, and the Ruhr. He defeated them in the Teutoburg Forest and thus secured the Frankish border in the name of King Chlotaire. When the Frisian leader Radbod died in 719, Charles seized West Frisia without any great resistance on the part of the Frisians, who had been subjected to the Franks but had rebelled upon the death of Pippin. When Chilperic II died the following year (720), Charles appointed as his successor the son of Dagobert III, Theuderic IV, who was still a minor, and who occupied the throne from 720 to 737 Charles was now appointing the kings whom he supposedly served, rois fainéants who were mere figureheads; by the end of his reign he didn't appoint one at all. At this time, Charles again marched against the Saxons. Then the Neustrians rebelled under Ragenfrid, who had left the county of Anjou. They were easily defeated (724), but Ragenfrid gave up his sons as hostages in turn for keeping his county. This ended the civil wars of Charles' reign. The next six years were devoted in their entirety to assuring Frankish authority over the neighbouring political groups. Between 720 and 723, Charles was fighting in Bavaria, where the Agilolfing dukes had gradually evolved into independent rulers, recently in alliance with Liutprand the Lombard. He forced the Alemanni to accompany him, and Duke Hugbert submitted to Frankish suzerainty. In 725 he brought back the Agilolfing Princess Swanachild as a second wife. In 725 and 728, he again entered Bavaria, but in 730, he marched against Lantfrid, Duke of Alemannia, who had also become independent, and killed him in battle. He forced the Alemanni to capitulate to Frankish suzerainty and did not appoint a successor to Lantfrid. Thus, southern Germany once more became part of the Frankish kingdom, as had northern Germany during the first years of the reign. In 731, after defeating the Saxons, Charles turned his attention to the rival southern realm of Aquitaine, and crossed the Loire, breaking the treaty with Duke Odo. The Franks ransacked Aquitaine twice, and captured Bourges, although Odo retook it. The Continuations of Fredegar allege that Odo called on assistance from the recently established emirate of al-Andalus, but there had been Arab raids into Aquitaine from the 720s onwards: indeed, in 721 the Chronicle of 754 records a victory of Odo at the Battle of Toulouse, while the Liber Pontificalis records that Odo had killed 375,000 Saracens. It is more likely that this invasion or raid took place in revenge for Odo's support for a rebel Berber leader named Munnuza. Whatever the precise circumstances, it is clear that an army under the leadership of Abd al-Rahman al-Ghafiqi headed north, and after some minor engagements marched on the wealthy city of Tours. According to Paul Fouracre, "Their campaign should perhaps be interpreted as a long-distance raid rather than the beginning of a war". They were however defeated by the army of Charles at a location between Tours and Poitiers, in a victory described by the Continuations of Fredegar. News of this battle spread, and may be recorded in Bede's Ecclesiastical History (Book V, ch. 23). Despite his victory, Charles did not however gain full control of Aquitaine, and Odo remained duke until his death in 735. Between his victory of 732 and 735, Charles reorganized the kingdom of Burgundy, replacing the counts and dukes with his loyal supporters, thus strengthening his hold on power. He was forced, by the ventures of Bubo, Duke of the Frisians, to invade independent-minded Frisia again in 734. In that year, he slew the duke at the Battle of the Boarn. Charles ordered the Frisian pagan shrines destroyed, and so wholly subjugated the populace that the region was peaceful for twenty years after. In 735, Duke Odo of Aquitaine died. Though Charles wished to rule the duchy directly and went there to elicit the submission of the Aquitainians, the aristocracy proclaimed Odo's son, Hunald I of Aquitaine, as duke, and Charles and Hunald eventually recognised each other's position. 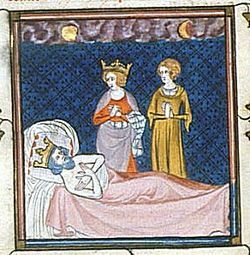 In 737, at the tail end of his campaigning in Provence and Septimania, the Merovingian king, Theuderic IV, died. Charles, titling himself maior domus and princeps et dux Francorum, did not appoint a new king and nobody acclaimed one. The throne lay vacant until Charles' death. The interregnum, the final four years of Charles' life, was more peaceful than most of it had been but in 738, he compelled the Saxons of Westphalia to submit and pay tribute, and in 739 he checked an uprising in Provence, the rebels being under the leadership of Maurontus. Charles used the relative peace to set about integrating the outlying realms of his empire into the Frankish church. He erected four dioceses in Bavaria (Salzburg, Regensburg, Freising, and Passau) and gave them Boniface as archbishop and metropolitan over all Germany east of the Rhine, with his seat at Mainz. Boniface had been under his protection from 723 on; indeed the saint himself explained to his old friend, Daniel of Winchester, that without it he could neither administer his church, defend his clergy, nor prevent idolatry. In 739, Pope Gregory III begged Charles for his aid against Liutprand, but Charles was loath to fight his onetime ally and ignored the plea. Nonetheless, the pope's request for Frankish protection showed how far Charles had come from the days he was tottering on excommunication, and set the stage for his son and grandson to assert themselves in the peninsula. Charles Martel died on 22 October 741, at Quierzy-sur-Oise in what is today the Aisne département in the Picardy region of France. He was buried at Saint Denis Basilica in Paris. At the beginning of Charles Martel's career, he had many internal opponents and felt the need to appoint his own kingly claimant, Chlotar IV. By his end, however, the dynamics of rulership in Francia had changed, and no hallowed Merovingian ruler was required. Charles divided his realm between his sons without opposition (though he ignored his young son Bernard). For many historians, Charles Martel laid the foundations for his son Pepin's rise to the Frankish throne in 751, and his grandson Charlemagne's imperial acclamation in 800. However, for Paul Fouracre, while Charles was "the most effective military leader in Francia", his career "finished on a note of unfinished business". Charles Martel divides the realm between Pepin and Carloman. Grandes Chroniques de France. Bibliothèque Nationale. Finally, Charles Martel also had a known mistress, Ruodhaid, with whom he had children Bernard, Hieronymus, and Remigius. Remigius became an archbishop of Rouen. For early medieval authors, Charles Martel was famous for his military victories. Paul the Deacon for instance attributed a victory against the Saracens actually won by Odo of Aquitaine to Charles. However, alongside this there soon developed a darker reputation, for his alleged abuse of church property. A ninth-century text, the Visio Eucherii, possibly written by Hincmar of Reims, portrayed Martel as suffering in hell for this reason. According to Paul Fouracre, this was "the single most important text in the construction of Charles Martel's reputation as a seculariser or despoiler of church lands". By the eighteenth century, historians such as Edward Gibbon had begun to portray the Frankish leader as the saviour of Christian Europe from a full-scale Islamic invasion, wondering whether without Charles' victory, "Perhaps the interpretation of the Koran would now be taught in the schools of Oxford". In the nineteenth century, the historian Heinrich Brunner argued that Charles had confiscated church lands in order to fund military reforms that allowed him to defeat the Arab invasion, in this way brilliantly combining two traditions about the ruler. But Paul Fouracre has argued that "...there is not enough evidence to show that there was a decisive change either in the way in which the Franks fought, or in the way in which they organised the resources needed to support their warriors." "Besides establishing a certain unity in Gaul, Charles saved it from a great peril. In 711 the Arabs had conquered Spain. In 720 they crossed the Pyrenees, seized Narbonensis, a dependency of the kingdom of the Visigoths, and advanced on Gaul. By his able policy Odo succeeded in arresting their progress for some years; but a new vali, Abdur Rahman, a member of an extremely fanatical sect, resumed the attack, reached Poitiers, and advanced on Tours, the holy town of Gaul. In October 732—just 100 years after the death of Mahomet—Charles gained a brilliant victory over Abdur Rahman, who was called back to Africa by revolts of the Berbers and had to give up the struggle. ...After his victory, Charles took the offensive". "Had Charles Martel suffered at Tours-Poitiers the fate of King Roderick at the Rio Barbate, it is doubtful that a "do-nothing" sovereign of the Merovingian realm could have later succeeded where his talented major domus had failed. Indeed, as Charles was the progenitor of the Carolingian line of Frankish rulers and grandfather of Charlemagne, one can even say with a degree of certainty that the subsequent history of the West would have proceeded along vastly different currents had ‘Abd al-Rahman been victorious at Tours-Poitiers in 732." "Today, historians tend to play down the significance of the battle of Poitiers, pointing out that the purpose of the Arab force defeated by Charles Martel was not to conquer the Frankish kingdom, but simply to pillage the wealthy monastery of St-Martin of Tours". "The continuators of Fredegar's chronicle, who probably wrote in the mid-eighth century, pictured the battle as just one of many military encounters between Christians and Saracens—moreover, as only one in a series of wars fought by Frankish princes for booty and territory... One of Fredegar's continuators presented the battle of Poitiers as what it really was: an episode in the struggle between Christian princes as the Carolingians strove to bring Aquitaine under their rule." More recently, the memory of Charles Martel has been appropriated by far right-wing groups, such as the 'Charles Martel Group' in France, and by terrorists in Christchurch, New Zealand in 2019. ^ This sculpture was located in the Palace of Versailles. By Debaye, pere, sculpted marble, 1839, first displayed at the Salon in 1839. Height 2.09 m. Soulié (1855), op. cit. ^ Paul Fouracre, The Age of Charles Martel, (Routledge, 2000), ix. ^ Schulman, Jana K. (2002). The Rise of the Medieval World, 500–1300: A Biographical Dictionary. Greenwood Publishing Group. p. 101. ISBN 0-313-30817-9. ^ Cawthorne, Nigel (2004). Military Commanders: The 100 Greatest Throughout History. Enchanted Lion Books. pp. 52–53. ISBN 1-59270-029-2. ^ Kibler, William W.; Zinn, Grover A. (1995). Medieval France: An Encyclopedia. Routledge. pp. 205–206. ISBN 0-8240-4444-4. ^ White, Jr., Lynn (1962). Medieval technology and social change. London, England: Oxford University Press. pp. 2–14. ^ Joch, Waltraud (1999). Legitimität und Integration: Untersuchungen zu den Anfängen Karl Martells. Husum, Germany: Matthiesen Verlag. ^ Gerberding, Richard A. (October 2002). "Review of Legitimität und Integration: Untersuchungen zu den Anfängen Karl Martells by Waltraud Joch". Speculum. 77 (4). pp. 1322–1323. ^ Costambeys, Marios; Matthew Innes & MacLean, Simon (2011) The Carolingian World, p. 43, Cambridge, GBR: Cambridge University Press, see , accessed 2 August 2015. ^ Paul., Fouracre, (2000). The age of Charles Martel. Harlow, England: Longman. p. 61. ISBN 0582064759. OCLC 43634337. ^ Paul., Fouracre, (2000). The age of Charles Martel. Harlow, England: Longman. pp. 84–5. ISBN 0582064759. OCLC 43634337. ^ Paul., Fouracre, (2000). The age of Charles Martel. Harlow, England: Longman. p. 88. ISBN 0582064759. OCLC 43634337. ^ "History of the Monument". BASILIQUE CATHÉDRALE DE SAINT-DENIS. BASILIQUE CATHÉDRALE DE SAINT-DENIS. Retrieved 27 January 2017. ^ a b c d Riche, Pierre (1993) The Carolingians: A Family Who Forged Europe, [Michael Idomir Allen, transl. ], Philadelphia, PA, USA: University of Pennsylvania Press, ISBN 0-8122-1342-4, see , accessed 2 August 2015. ^ Paul Fouracre, 'Writing about Charles Martel', in Law, Laity and Solidarities: essays in honour of Susan Reynolds, ed. Pauline Stafford et al. (Manchester, 2001), pp. 12-26. ^ Paul., Fouracre, (2000). The age of Charles Martel. Harlow, England: Longman. p. 85. ISBN 0582064759. OCLC 43634337. ^ Paul., Fouracre, (2000). The age of Charles Martel. Harlow, England: Longman. p. 124. ISBN 0582064759. OCLC 43634337. ^ "Decline and Fall of the Roman Empire". ^ Paul., Fouracre, (2000). The age of Charles Martel. Harlow, England: Longman. p. 149. ISBN 0582064759. OCLC 43634337. ^ Pfister, Christian (1911). Encyclopedia Britannica. ^ Watson, William (1993). "The Battle of Tours-Poitiers Revisited". Providence: Studies in Western Civilization. 2. ^ Tomaž., Mastnak, (2002). Crusading peace : Christendom, the Muslim world, and Western political order. Berkeley, Calif.: University of California Press. ISBN 9780520925991. OCLC 52861403. ^ Palmer, James. "The fake history that fueled the accused Christchurch shooter". Wikisource has the text of the 1905 New International Encyclopedia article Charles Martel. Ian Meadows, "The Arabs in Occitania": A sketch giving the context of the conflict from the Arab point of view. http://www.standin.se/fifteen07a.htm Poke's edition of Creasy's "15 Most Important Battles Ever Fought According to Edward Shepherd Creasy" Chapter VII. The Battle of Tours, A.D. 732. "Charles Martel" . Encyclopædia Britannica (11th ed.). 1911.